I first visited Crossroads Farm in October of 2018. As I mentioned in my article about that trip, the Crossroads Farm Founders Doug and Dawn Routledge and myself just clicked as we share similar hearts and visions for rural ministry. Before my visit was finished, we knew we needed to get our two teams together to see what God might have in store. Dirt Roads Network Team Members Mark Adams, Kara Hulburt, Julia Pyle and I spent March 15-17 at Crossroads Farm for a preview weekend. We were there with people from northern Michigan and Ohio who are considering starting branches of Crossroads Farm in their respective areas. Crossroads Farm ideally wants to start branches out in the country, that are not associated with a particular church or school district. This allows each Crossroads Farm branch to be the youth ministry of several rural communities and churches in a cooperative way. During our visit on Saturday, we met with the leaders and volunteers of Crossroads Farm. They walked us through the ministry’s very structured training and development plan. Their effective approach has been carefully crafted during the 20 years since Crossroads Farm was founded. On Sunday morning we visited several rural churches that cooperate with Crossroads Farm and had lunch with the pastors afterwards. They were very positive about the relationship between their churches and Crossroads Farm and the partnership’s positive impact for Christ on rural teens. On Sunday night we experienced a weekly Crossroads Farm event called Barnyard. It is open to any student in sixth through 12th grade. It takes place at The Shed, Crossroads Farm’s large metal barn headquarters in the middle of the country. More than 200 teens were in attendance that night. There were games, skits, live worship, a challenging sermon and small group discussions afterwards. We watched as more than 30 volunteers worked seamlessly together. It was a Spirit-filled and impactful evening. After the meeting we spent a few hours with the leaders hearing the amazing stories of how God had provided for the ministry over the years. Our visit continued Monday as we joined the Crossroads Farm team leaders and students in their monthly Jericho Walk. The Jericho Walk involves 11 school districts. The students spend about 30 minutes walking the halls of the school praying. This is done early in the morning before the other students arrive. We watched as students and leaders prayed over their friends’ lockers, the gym and cafeteria. A few teachers even came out and prayed with some of the students. Crossroads Farm’s strong relationship with the local schools was on full display. Lastly, we met back at the main Crossroads Farm location to hear from those who were raising their own financial support. 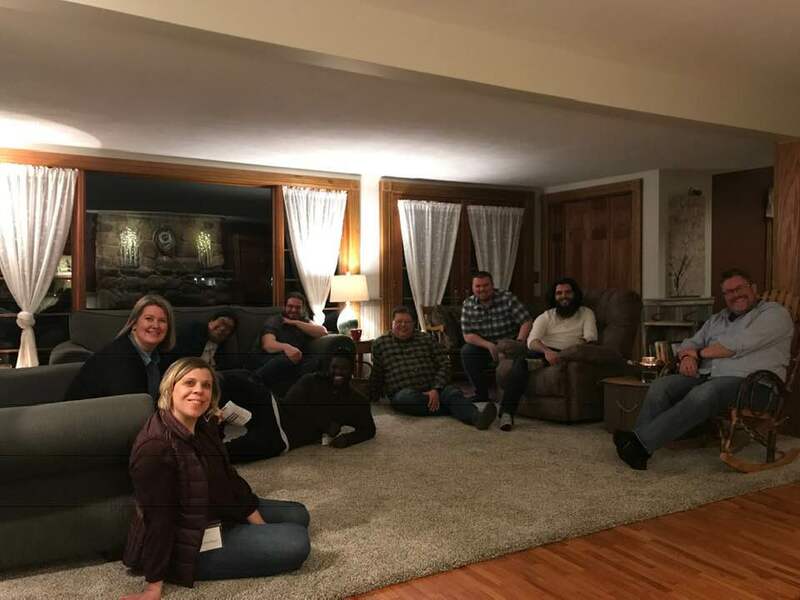 The leaders shared that they consider themselves to be missionaries and raise their own funding in order to serve in the rural youth mission field. To put it mildly, we were very impressed with the leaders, volunteers and the entire weekend! These guys love rural teens passionately and effectively and we want to learn from them and partner with them. In fact, we are praying about and discussing a specific partnership between Dirt Roads Network and Crossroads Farm. There are two distinct possibilities we are prayerfully considering. The first would be to start a branch of Crossroads Farm in the Lamont area. This Crossroads Farm branch would provide outreach to rural youth throughout Greenwood county and neighboring rural areas. The second option would be to start a Crossroads Farm branch around the Iola, Humboldt, Yates Center and Chanute area. This second option would be part of Dirt Roads Network’s idea for a team of people to plant several small churches at once—also known as a church planting cluster. In this scenario, Crossroads Farm would provide the youth ministry for the four new church plants and outreach to all rural youth in that region. We are requesting that each of you reading this update would join us in prayer for God’s direction. We feel him strongly leading us towards a Crossroads Farm partnership, and we want to fulfill His purpose in His chosen place. There is no doubt that rural southeast Kansas teens are slipping through the cracks and Dirt Roads Network wants to help stand in that gap with Crossroads Farm. Stay tuned to find out where God ultimately leads our partnership with Crossroads Farm.